HandEra, the company formerly known as TRG brings to us today the HandEra 330, its newest offering to the competitive field of PalmOS devices, and personal digital assistants in general. Building upon the success of its TRGpro model, the HandEra 330 takes its design and builds and improves upon it in almost every single way possible. Let’s take a look. The biggest and most obvious feature about the HandEra compared with any other PDA on the market is its high-resolution display. 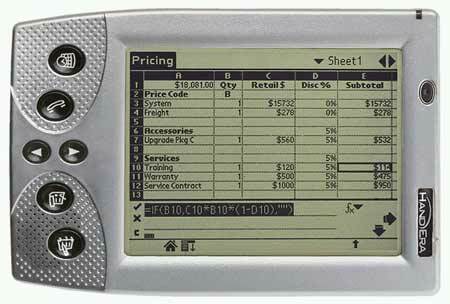 The QVGA screen offers three times the resolution of most regular PDAs - Currently, only some of the Sony CLIÉ models feature the high-res screen. 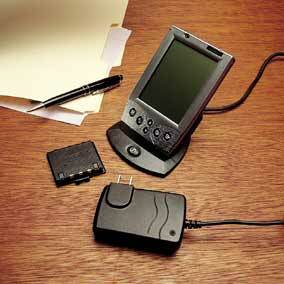 The HandEra 330 has built-in PalmOS extensions to run applications that support high-resolution modes. Basically, if any software you've downloaded supports the option on the CLIÉ, it should also run in high-res on the HandEra. For all the rest of your legacy applications, however, the HandEra can center the window, align it to the upper-left, or scale it to fit. Scaling seems to work best with any applications that just use text and fields, like a database application. I got rather erratic results with any other program - I tried using some of the Palm Desktop standard games like HardBall - Some ran, but showed obvious graphic defects and pixel dragging due to the software failing to remove the pixels drawn by the scaling operations. Other apps crashed, or weren't scaled properly, pushing the window off the screen. Your best bet is to run your legacy apps in centered mode, and hope that the developer updates it to support high-res screens. With many Palm apps being updated for color support, it's also a reasonable probability that the authors of your favorite app might consider it. As if the extra resolution wasn't enough for you, the HandEra 330 uses a virtual silk-screening area. This is an incredibly cool innovation - your Graffiti strokes are actually drawn on the silk-screen area as you trace them, which helps anyone get used to the writing system rapidly. Furthermore, the silk-screen is retractable, allowing you to reclaim some extra screen space to read longer e-mails and documents. If the width of the screen annoys you though, having three or four words per line in your message, then you can rotate the screen! The major applications that come with the HandEra support screen rotation, so you can simply change the preferences and your e-mail gets turned sideways. Again, this is another feature that will hopefully get implemented in more apps over time, but I wouldn't count on widespread support for this one, simply because it may be considered to be unimportant compared to other apps. 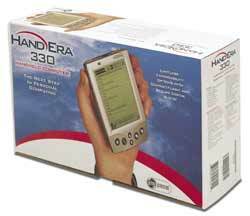 While we're talking about applications, let's go ahead and mention the ones that come with the HandEra 330. While very few come preinstalled on the unit, the software CD that accompanies the unit contains a few critical applications for your HandEra, namely Quickoffice. Quickoffice is a conduit application that allows you to take pre-existing Word documents and Excel spreadsheets and convert them into a miniaturized format that you can easily manage on the HandEra. Quickword is a reasonably good tool to read over Word documents, and it preserves about as much formatting as WordPad does. Trying to create a new document might be a little cumbersome using Graffiti, but if you have a Palm III-compatible keyboard, you can simply attach that to the HandEra, and type away. Putting in new formatting and other options is cumbersome however, if possible at all - Quickword doesn't support bulleted/numbered lists, varied font sizes, and quite a few other simple formatting options. Quicksheet is quite a bit more robust, on the other hand - It supports cell data formatting, functions and calculations and even charts. I tried this many times and while I was able to sync some small applications and databases, I had a significant amount of trouble with anything over 100K. Usually it'd time out before completing the sync, and even sending a small 20K file would take over a minute. Generally the HandEra would only exchange four packets of data every ten seconds. On the other hand, running a telnet session using Top Gun telnet was perfectly useable, and downloading mail messages from my POP3 server didn't take any time at all, which lends me to believe that a problem with the HotSync configuration tools in the OS itself. 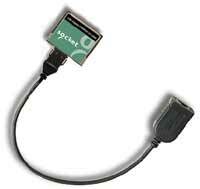 As a further note, configuring HotSync to work over Ethernet is not at all well documented, and requires a rather long procedure of changes and preference selections…so I would chalk this up to a hack that exploits a capability in HotSync that wasn't originally intended to be used this way. On the other hand, the CF+ slot works great for pretty much anything else. CardPro lets you install applications from your CF card - Great if you have a laptop, since you wouldn't need to have the HotSync cradle with you…but there is a caveat - CardPro doesn't handle application databases very well. The rule of thumb is that if your application is just a single PRC file, you can do it, but otherwise, it's probably not going to work the way you expect it. Now that we've gone over the expansion capabilities of the HandEra, let's look more at what it offers straight out of the box. Along the left-hand edge, you'll see two extra controls - a button, and a shuttle dial. The side button is programmable within PalmOS to operate as you see fit - It comes configured by default to cancel menu selections and also to work with the VoicePad application. Since the HandEra comes with a built-in microphone, you can use the HandEra to take voice memos and record them in WAV format. A nice feature of VoicePad is that it is capable of recording to RAM, CF, or SD. 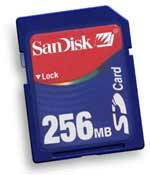 Unfortunately, since it records in WAV, your free space will likely fill up quickly. On-the-fly MP3 encoding would be nice (or some other compression codec), but with a 33MHz Dragonball processor, it's a slim-to-none proposition. Perhaps a newer, more powerful unit with a StrongARM processor would have this capability (once PalmOS 5 gets released). The shuttle dial is also something we're seeing more of in PDAs recently. Other PDAs on the market to use the shuttle dial include the Kyocera SmartPhone QCP-6035 and the upper end Sony CLIÉ models. The shuttle dial is most useful for one-handed e-mail and message scrolling. You can also use it in the app menu to select an application, and push in on the dial to launch it. This, like the auxiliary button, is programmable (As are the other primary buttons). One final feature to touch on is the HandEra's power system. The HandEra normally runs on four AAA batteries, and gets a decent amount of runtime. My general usage drained the batteries within a month, and that's with a few hour-long sessions of SubHunt. Since I didn't want to have to buy batteries every month, I went ahead and invested in the HandEra 330 rechargeable kit, which includes an AC adapter and a Lithium Ion battery pack. Installing the battery pack was less intuitive than I had hoped - I actually had to remove the battery contact assembly to install the pack. Personally, I think that was a bad choice - If I'm stranded out in the middle of nowhere and I run out of juice, it's nice to be able to pop in some batteries as backup, but you're out of luck if you didn't bring the battery terminals with you. I tore my heart out deciding on the HandEra 330 over the Sony CLIÉ N760...I really wanted a PDA that could function as an MP3 player, but the Sony is the only one on the market with that capability. Other Palms have the option of an add-on MP3 kit, but generally these kits have gotten poor reviews, and so I had long since crossed out that option. 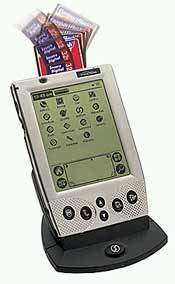 This may actually be something that we'll see more of with the forthcoming introduction of PalmOS 5. Even though the OS won't have native support for MP3 playback, it'll have support for other processor architectures outside of the Dragonball line, and so we might see strong enough Palms to handle the playback in software. The placement of the shuttle dial is a bit troublesome. On the one hand, it's great for using the screen in its regular rotation…on the other hand, its placement is highly illogical for anyone who uses the screen rotation tool. I almost never used screen rotation though, so this wasn't a big deal for me.